But today I want to talk about eating out in restaurants. If you are living a paleo and/or gluten-free lifestyle, you are facing a challenge when you go out to eat. Looking at a typical restaurant menu, you will find a lot of dishes that contain wheat and sugar. You have the choice of salads, with and without meat or fish, but you need to stick with olive oil and vinegar dressing and prepare it yourself. Any kind of creamy dressing has at the least artificial flavors and colors as well as high fructose corn syrup. For main dishes you can choose meat or fish. As much as I love barbeque, it is not easy to find the meat without a ton of sauce on top. As a side I prefer roasted or steamed vegetables. There won’t be a suitable dessert that is paleo and/or gluten-free available. So, yesterday I went to lunch with my friend at the Vienna Café. When I looked at the menu I saw that they had a quarter of that menu filled with pasta dishes. They are a no-no 🙂 And the other quarter was sandwiches. Not a good choice either, unless you go without the bun. Then there was a small section of salads and some meat and fish dishes. There are some restaurants that offer gluten-free dishes, but you still need to ask the waiter what will be in your dish. I ordered one time a gluten free chicken dish and when it came it had some kind of creamy cheese sauce on it. The menu listed it as blue cheese chicken breast. So I asked the waiter if he could inquire with the cook, what the blue cheese sauce had as ingredients. And as I suspected they put in wheat flour to make this creamy sauce. I am lucky that I am not gluten sensitive, so I did not have any problems. But if someone is highly gluten intolerant they would have been in trouble. There was really no need to put flour in the cheese sauce. When I make this dish at home, I either melt the blue cheese over the chicken, or I stuff the chicken with blue cheese. No need for anything else. But in a restaurant they go for profit and in order to stretch that sauce they put in flour – so you get more portions out of it. As for dessert, I always eat it at home. Just in case. Even if it says gluten free chocolate cake, it is probably made with a gluten free cake mix. And they pretty much all have some undesirable ingredients in it. If you follow a paleo and/or gluten free life style you can still enjoy going to a restaurant. You just have to be smart and choose a salad or meat dish. And if in doubt – ask the waiter. 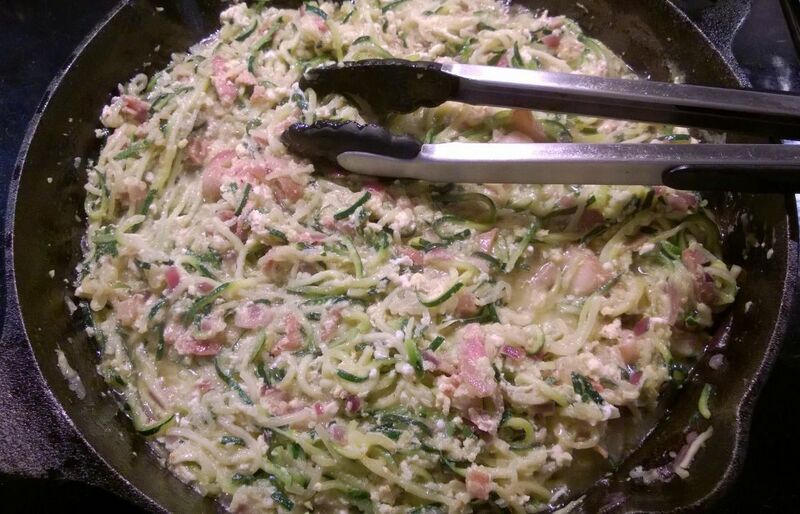 We will be having my favorite Zucchini Carbonara Pasta tomorrow and it will be posted with pictures. When you live a paleo – gluten free lifestyle, going out to eat is not as difficult as it seems. If you go to a restaurant, there is always something to eat. 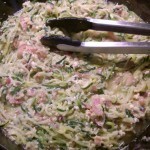 I am just very cautious with the so called gluten – free dishes. Most the time they are not a good choice. Other than that, no problem.